The old decaying cities of the midwest and Northeast look a lot more like cesspools than California. I try not to generalize but there are ugly parts of states in the U.S, there are nice parts, and there are ridiculously nice parts. And then there are the barrios. S E San Diego is scary even in the daytime. I bet even you wouldn't hang out over by the WIC office in CV after dark. All big cities have ghettos it's just a bummer that the ones in LA, San Diego and other border cities like Houston and Phoenix are growing exponentially due illegal immigration. Why would I be hanging outside of a WIC office anyway? And if there were no L.A barrios we wouldn't have Low riders . Even my neighbor who is from Hawaii has one! Indeed all big cities have ghetto's. 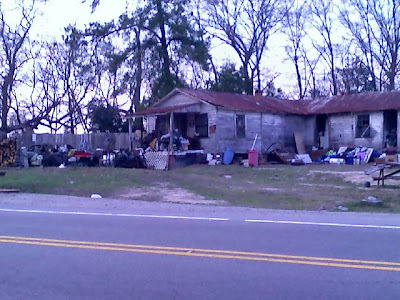 I don't think there is a city in the U.S that doesn't have a ghetto. Look at New York back when immigrants were flooding in via Ellis Island. Parts of new york looked like a dump. And to make matters worse, people would dumb escrements out their windows. The thing is, California cities just arent that old. New York and Philly and Jersey are all hundreds of years old. California has only been decaying for what? 50 years? San Francisco is pretty old. It was one of the first major cities in California, back when the Spanish settled it in 1776. Guess what race lives in this house?They come in all races and colors guys.Let's stop the madness and not pre judge. The biggest city in California, Los Angeles, didnt really have an exploding population until within the past 50 years. All the "bad neighborhoods" of today were inhabited by white people, then the black people, and now the Latino people. As bad as people make out LA and southern california to be, it isn't all that bad. The older cities in the Northeast and midwest that have had a population of over a million for a very very long time, are a lot more dilapidated and older, a lot more decayed. And for some reason, crime is higher. Its not really a generalization, I'm just saying "bad neighborhoods" in LA, SD, even San Francisco from my understanding, have only been "bad neighborhoods" for a few decades. A lot of bad neighborhoods in the older cities have been bad for a long time. As much as people want to say how certain areas of LA are starting to look like Tijuana, I think places in New York are more like Tijuana. But I guess when they say that, they arent really talking about decay, theyre talking about the presence of Mexican folks and Spanish being spoken.